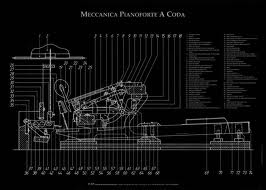 The piano action is the mechanical component of a piano. Over time the action will change, wear in, felts and leathers compact and wear, as due the hammers, as well as changes in woods and felts due to variances in humidity. With these changes tone and touch are affected and decline. Therefore, periodically the instrument requires regulation. Simply put, regulation is the adjustment of all of the moving parts in the piano's action and can also entail repairs to, refurbishing of, or replacement of parts. Occasionally there may arise the need for parts repair or replacement and the voicing of the hammers. If the touch or tone becomes uneven and control becomes difficult, notes do not repeat quickly, or there are notes that continue to sound after the key has been released, parts squeak, keys rattle or are sluggish or stick, or the tone seems to have become harsh, it is time to have the piano regulated. You may be conscientious and have the piano tuned regularly. However, it seems that the overall performance of the instrument has deteriorated. You probably wouldn't even notice until notes weren't working properly as the decline of the action happens in an extremely subtle manner over months and years. Tuning adjusts the tension of each string to correct the pitch of said string and the overall musical quality of the instrument. Your piano also requires adjustment to the more than 9,000 parts which transfer the motion of your fingers on the keys to the hammers ultimately striking the strings. For the action to respond properly to the pianist’s touch, critical tolerances must be maintained between these parts. Instruments used for professional performance may require some minor regulation before each use, due to the higher demands placed upon them. 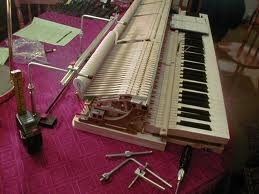 New pianos often require regulation within the first few years, due to parts settling in. Music, a most complex method of expression, relies on the personal dynamics of the pianist. The pianist relies upon an instrument capable of a smooth, even and extremely fast touch to deliver the subtle shadings of his performance. The condition of the action’s parts will be assessed, worn or damaged parts repaired or replaced prior to regulation, and then regulated. If the action has deteriorated beyond simple repair, it may need to be rebuilt. A piano is a major investment, which, properly maintained will provide a lifetime of enjoyment. It is also an heirloom providing your children and grandchildren the same pleasure. It deserves to be protected through regular service by a qualified, experienced technician. No amount of practice can compensate for a poorly maintained instrument.